Fiat sold more than 74,000 Pandas during the first four months of the year, making it Europe's top-selling minicar during the period. European minicar sales – especially at Fiat Chrysler Automobiles -- are getting a lift from the continuing economic rebound in Italy, which is the top market for the region's smallest, most affordable vehicles. Through April, Italy’s minicar sales were up 20 percent to 129,770 vehicles, giving the models a 25 percent share of the market, according to figures from JATO Dynamics. The car that has benefited most is the Fiat Panda, which has overtaken the Fiat 500 to become the segment's best-seller with a volume of 74,018 units across Europe, an increase of 21 percent. Rising demand in Italy, as well as growth in Spain and Portugal, have boosted Europe's overall minicar segment by 3.8 percent after four months, but the sector (also called the A-segment) will level off at about 1.2 million annually from 2016 to 2020, analysts at IHS Automotive predict. IHS believes that demand has stabilized following significant sales increases and decreases between 2009 and 2014. Minicar volume rose to more than 1.6 million in 2009, which is when small, affordable cars became even cheaper to buy because a number of European governments started offering trade-in incentives to support automakers during the height of the global financial downturn. The surge was followed by a decline to about 1.13 million minicar sales in 2013 and 2014 because so many purchases were pulled forward by the incentive offers. 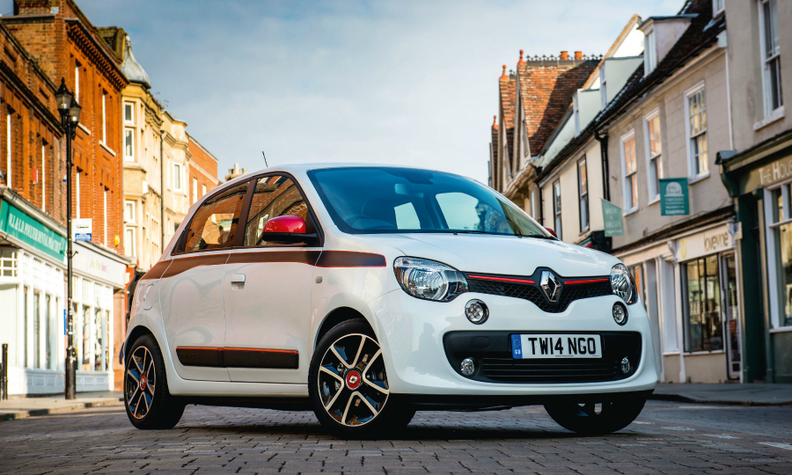 European sales of the Renault Twingo were down by 20% through April. The recent highs and lows, the predicted flatness of the segment as well as the difficulty most automakers have had turning a profit from minicars has convinced manufacturers such as Ford Motor and Nissan to leave the sector. Ford will end sales of the Ka after a two-decade run and offer a pair of vehicles in the subcompact segment: the Ka+ and the Fiesta. The Ka+, which is just a few millimeters shorter than the Fiesta, will be Ford’s entry model for Europe. The current Ka shared a platform and factory with the Fiat 500, but it never came close to matching the success of its sibling model. "Either you partner with someone in this segment or you’re out," said a Ford official, who didn’t want to be named. The Ka+, which is 3929mm long compared with 3620mm for the current Ka, goes on sale in the autumn. Ford says the arrival of the Ka+ allows it to reposition the next-generation Fiesta more upmarket when it debuts early next year. Ford said it will drop the Fiesta's Ambiente base trim line to leave the subcompact segment's entry price level to the Ka+. Disappointing sales of the Ka, which had a volume of just 12,975 units through April compared with 68,068 for the Fiat 500, was "partly our fault," said a Ford source who declined to be named. 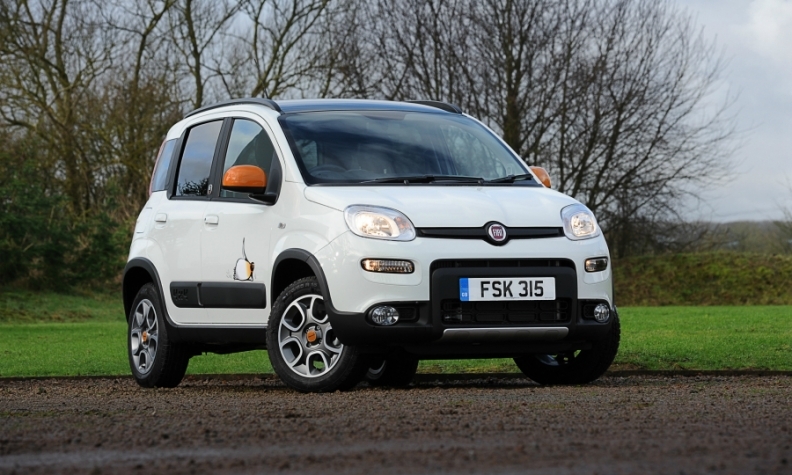 "Fiat really turned the 500 into its own brand and we could have done more with the Ka, too. But when you're completely focused on returning to profitability [which Ford of Europe did in 2015 after three years of losses], investing more time and effort into a segment that on good days barely makes money is just not a priority," the source said. Nissan, meanwhile, is reluctant to rejoin the segment after dropping the India-built Pixo in 2013. "If you look at the volume and expected profit from those vehicles, I'm not convinced there's a significant place for an A-platform car in Europe," Trevor Mann, Nissan's chief performance officer, told Automotive News Europe. Nissan and alliance partner Renault have also said they don't plan to re-engineer the successful India-built Kwid for Europe. Renault is struggling in the minicar segment with the rear-wheel-drive Twingo as sales of the car fell by 20 percent to 29,081 in the first four months, according to JATO's figures. 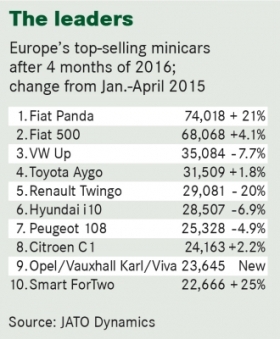 The decline dropped the Twingo to fifth place behind the similarly aged Toyota Aygo. The dip came despite the popularity of minicars in Renault's home market of France, which ranks fourth in Europe behind Italy, the UK and Germany. 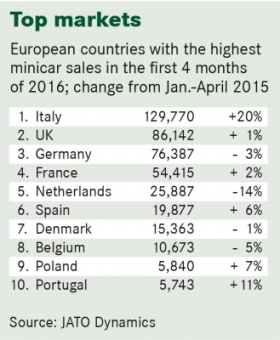 French minicar sales rose 2 percent to 54,415 in the period. Renault's expectations for the car haven’t been met, said IHS analyst Ian Fletcher. IHS reports that last year Renault cut a shift at its Twingo factory in Novo Mesto, Slovenia, where the car is built alongside its platform mate, the Smart ForFour. Fletcher believes some customer are put off by the Twingo's rear-engine design, which reduces trunk space. Another problem is that the Twingo is facing competition from its larger sibling, the Renault Clio. "Some deals Renault has at the moment don't put the Clio that far away from the Twingo [in price]," Fletcher said. 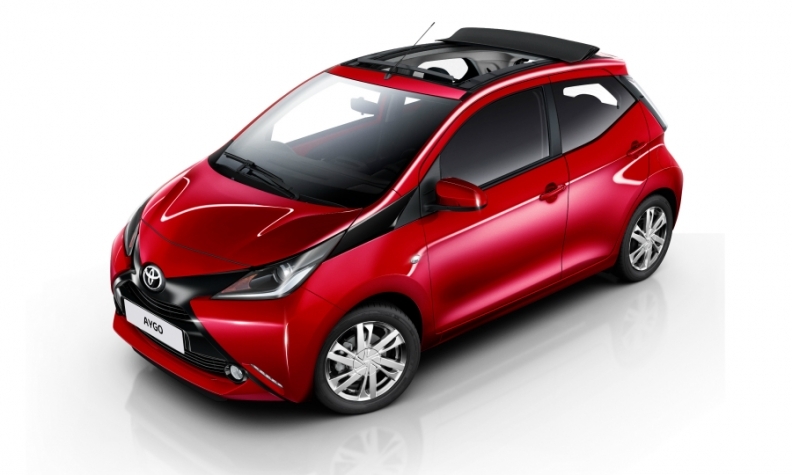 Toyota has increased European sales of the Aygo by offering more customization options. Sales of the Aygo, meanwhile, are holding up because Toyota is meeting strong demand for personalization options. "Customization in that segment is very, very popular," Toyota Europe CEO Johan van Zyl said on the sidelines of the Automotive News Europe Congress in Munich last month. The Aygo's wide choice of colors and features is attracting a younger crowd, van Zyl said. Other automakers are adapting their models to try to win new buyers. Renault, for example, will launch a GT version of the Twingo later this year that boosts power from the car's 1.2-liter turbocharged gasoline engine to 110 hp compared with 90 hp for the base Twingo. Volkswagen showed a face-lifted version of the Up at this year's Geneva auto show featuring a 1.0-liter turbocharged TSI gasoline engine for the first time, as well as a dashboard dock for a smartphone to create an inexpensive infotainment system via a VW app. Meanwhile, Hyundai will use the Paris auto show in September to unveil a face-lifted version of its i10 minicar that has been redesigned to attract younger buyers, a company source said. As the segment's sales level off minicars are expected to have a market share of about 9 percent within Europe, making it the region's third-largest segment after subcompacts and compacts. That number won't be declining any time soon, JATO Dynamics global analyst Felipe Munoz said: "The segment will always appeal to a variety consumers: first-time car buyers, single people, or simply because of parking reasons," he said. "And it doesn't face direct competition from the SUV segment, at least not for now."